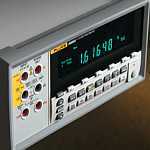 The Fluke 8808A 5.5 digit multimeter dependably performs the most common measurements required by todays applications. Whether you are performing functional tests or making critical measurements on test points, using the limit compare mode with pass/fail indicators eliminates production mistakes, especially those where results are on the edge. The 8808A display has built-in enunciators that clearly show the operator whether a test passes or fails. The pass/fail indicators take the guesswork out of testing: the result is either within limits or its out! Manufacturing test, R&D, development and service applications demand performance and flexibility from a bench meter. This Fluke 8808A makes measurements that stand up to any scrutiny. It delivers a wide variety of measurement functions, including volts, ohms, and amps, plus frequency all at superior accuracy and resolution. Patented split terminal jacks for the 2x4-wire ohms function allow you to perform 4-wire measurements using only two leads instead of four. Todays surface mount components make it difficult to make connections. The task becomes even more difficult when you need to use a 4-wire technique for accurate low ohms measurements. The Fluke test lead accessory combines the four wires into two test lead pairs, making it easy for you to establish connections. You get excellent resolution and accuracy, plus the convenience and ease of using a single pair of leads. FlukeView Forms increases the power of your Fluke tool by enabling you to document, store and analyze individual readings or series of measurements, then convert them into professional looking documents. Transfer data points from your meter to your PC and use the standard, non-customizable forms to display your readings in table or graphical form. For a larger array of forms or to use FlukeView Forms Designer customize your forms, upgrade to FlukeView Forms 3.0 with FVF-UG. Fluke is known around the world for its rugged, reliable, and accurate multimeters. With our experience, design standards and quality assurance processes, we have designed a multimeter that will stand up to any scrutiny of its specifications. In fact, a Fluke meter typically performs better than specified. All of our efforts are designed to ensure that you can make an accurate measurement repeatedly, and with confidence.